I’ve been there and I bet you’ve been there too. Sitting in a waiting room, strangers around you, trying to fill out a long questionnaire. I don’t know about you, but the awkwardness of waiting rooms doesn’t put me in a mental state that’s conducive to sharing private information. As a practitioner, I’ve been on the other side too. Scanning questionnaires so I can file them in my EHR system. Buying tons of paper and ink. Filling drawers with documents and signatures. It takes time and money. Not fun. Why not just send the questionnaire to the patient so they can fill it out and send it back to us? That’s easy enough, right? Unfortunately, that does not comply with privacy rules in most countries (HIPAA, PIPEDA, etc) and I’m not willing to risk paying thousands of dollars in penalty fees. We could still email the questionnaire, ask the patient to print it, fill it out by hand and bring it with them to the appointment. In fact, that’s what a lot of people have been doing nowadays. My problem with this approach is that you’re telling your client to use their own resources (ink and paper) to make your workflow easier. And honestly, even waiting room questionnaires make you look more professional than asking for patients to print forms. If you’re serious about how your practice is perceived and respect your patients’ time and privacy, using online intake forms is the obvious solution to the problems mentioned above. Let’s look at some of the benefits of a paperless intake process. Maintaining a paper solution is resource-intensive and processing them is time consuming. 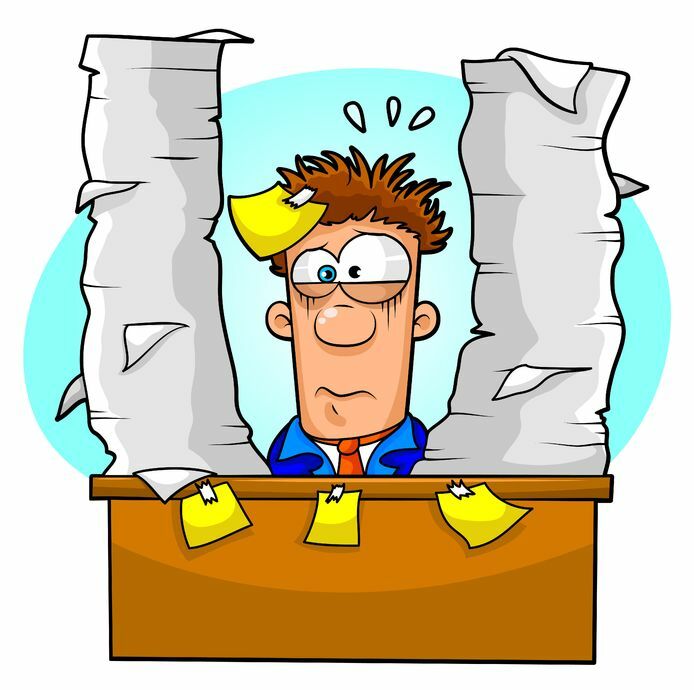 Don’t waste time scanning documents, transcribing information or keeping track of paper files. Instead of making your clients do paperwork in order to see you, provide them with a pleasant onboarding experience. 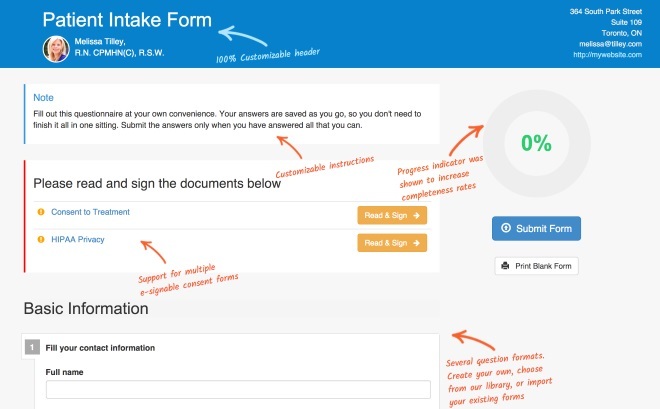 People are used to the convenience of doing everything online nowadays, but intake forms is one thing that’s still lagging behind. Using online intake forms will give you a significant competitive advantage. For many, the greatest benefit of using online intake forms is that the practitioner will receive the completed questionnaire well in advance. This allows them to be prepared when it’s time for the appointment. With e-signatures being recognized as legally binding in most of the world, there’s no more need to keep drawers of signed agreement documents. They will always be available online, whenever you need them. Practitioners who use electronic intake forms have noticed an increase in questionnaire completeness rates. That’s not surprising, since they’re filling it out in the comfort of their homes, without the time constraints of a waiting room. While having your forms online may be the solution, most practitioners are not programmers and hiring one is expensive. Specially a good one. Not to mention the costs of hosting an infrastructure that is compliant with HIPAA technical requirements. But wait! Don’t give up the dream of online intake forms just yet. IntakeQ was conceived to solve the inherent problems of traditional intake forms and offer all the benefits mentioned above. Our goal was to make it as affordable as possible, while making sure not to compromise on quality and security. 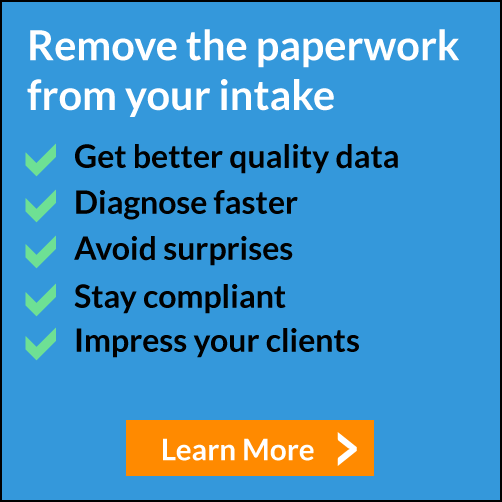 IntakeQ allows you to build secure custom intake forms that your patients will love. It supports every question format you can imagine and lets you use your own branding in your forms. But don’t take my word for it. You can see the benefits for yourself before spending a single dime. Sign up for a free 14-day trial and start improving your practice today.